Are you worried about your polish chipping in a day or two? Look no further! Here are some of the best ways to ensure that your polish lasts longer without chipping. Avoid Water: Before you apply your base coat to ensure that your nails are completely dry. The best way to ensure that is to buff the nails and then apply a base coat followed by the nail polish. Avoid Oils: Always wash your nails well before applying your polish. 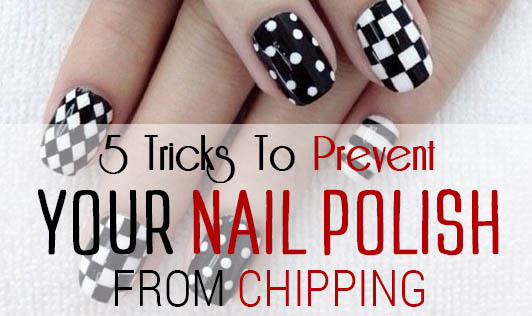 Excess oil, lotions, or cuticle creams may not allow the polish to adhere to your nails. This may lead to chipping. Allow Nails to Dry: Keep at least 2 minutes gap between each coat of the nail polish. For darker shades keep at least 3 minutes gap, as they take longer to dry. Go for a Chip-Resistant Top Coat: Allow your polish to dry completely before you apply the top coat. This will ensure that your manicure lasts for a longer time. Dip your Nails in Ice Cold Water: When you’re done painting your nails, dip your fingers in ice cold water as it hardens the polish and sets it. Follow these tips before you put on a fresh coat of polish and make your manicure last for days!